After a bit of a hiatus, I am back to report on my cooking exploits. Rest assured I have not been neglecting to feed the Battenburg family, not to mention various others, it’s just that events have conspired to keep me away from the blog. So I will try to remember what I’ve cooked of late and tell you all about it. I’m going to have to go in reverse order though. 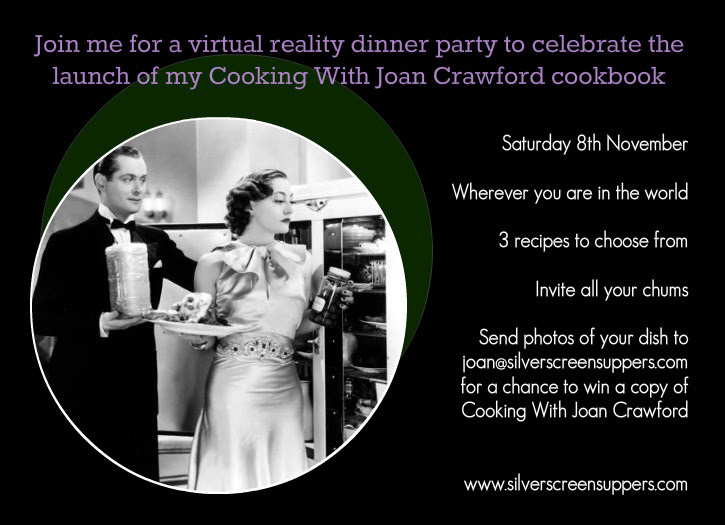 The most exciting recent food event has to be the Joan Crawford Virtual Dinner Party last weekend – this was courtesy of Silver Screen Suppers to celebrate the launch of her gorgeous new book Cooking with Joan Crawford. It’s a really lovely book – some great recipes from Joan, who was apparently an avid and talented cook, as well as an excellent actress, if not, allegedly, a shining beacon of motherhood. There were meant to be six of us. But just after I sent out a text alert advising my chums that there was no need to hurry, as I was ridiculously behind with everything, I got a call from Usman. It turned out that Nathalie had managed to fall over (she’s way to young to have “had a fall”). She did at least manage to do this right outside A&E, where she spent the rest of the evening having her broken arm attended too. Obviously that was bad for her, but think of us – a large jug of cocktails meant for six had to be dealt with by the remaining four of us – Joan’s Crawford’s Cosmos – 3 parts vodka, two parts cranberry juice and one part orange & Brandy liquer (which I got from M & S – don’t know exactly what Joan used). We took our mission seriously, while tucking into some of Joan’s cheese straws. 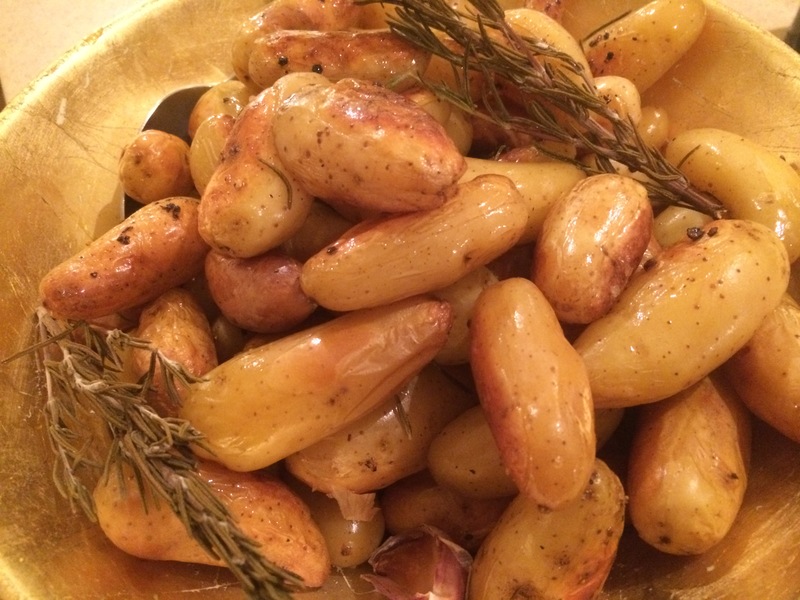 These weren’t actually one of the designated dishes for the evening – the starter was meant to be Danti chips, but I had these once before – see my 10 glorious years post – in which I seem to have pretended I liked them). In fact, to quote a friend of Missy B’s “I didn’t love them”. I sought permission from Jenny and was given her blessing to trying another starter from the book. Mix the shortening, oil or butter into the dry ingredients, using a knife or rub in with your fingers. That’s it – apparently it keeps for up to four months, if stored in an airtight container. It worked very well – the cheese straws were a bit doughy for my liking, but the kick of a sprinkling of paprika was very good. 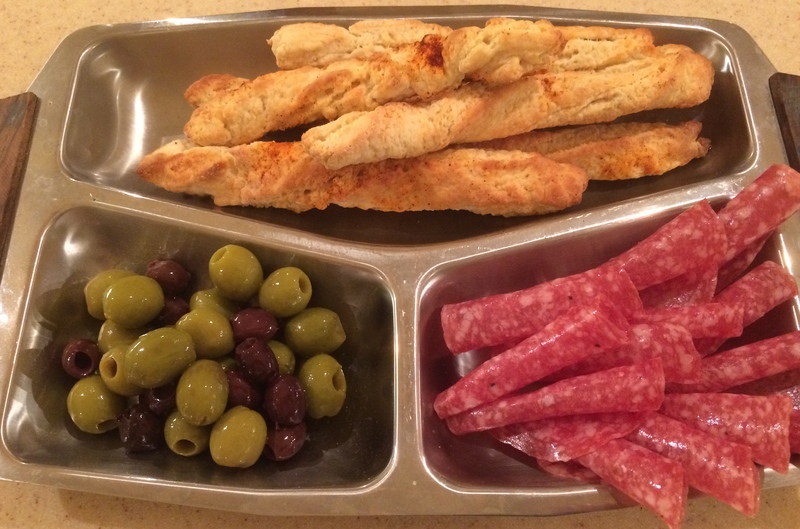 Not sure if Joan herself would have been impressed with my offering of olives and salami to accompany them, but they all went. 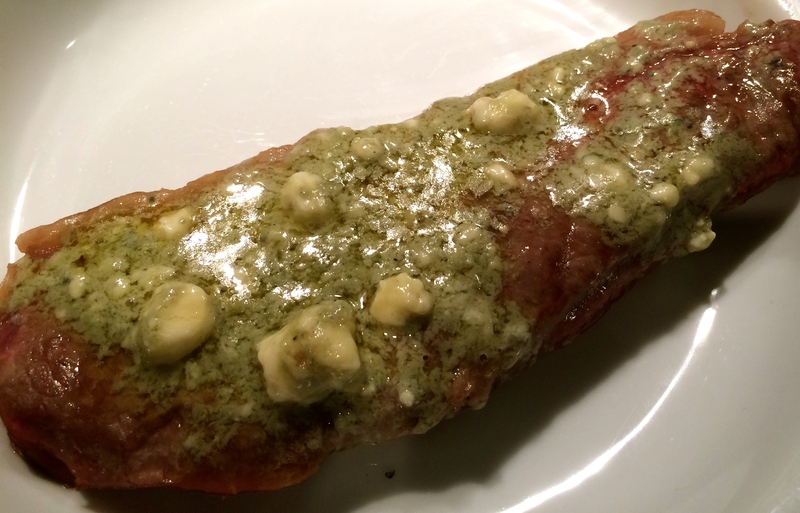 Joan’s steak with roquefort was excellent – steaks from Muddy Boots Foods in Crouch End, griddled briefly then stuck under a grill with a sauce made from roquefort, mustard and butter. The sauce was on the runny side and slid off the steaks a bit but very delicious. There were no instructions for accompaniments for the steak, so I went with a big green salad and these potatoes en papillote. 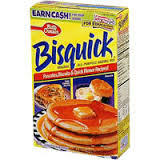 Made far too many of those, a usual but they make for a fine, if garlicky, breakfast. Just add eggs, any style. Nathalie was planning to sort out the dessert course for me, so the crepes suzettes didn’t happen. 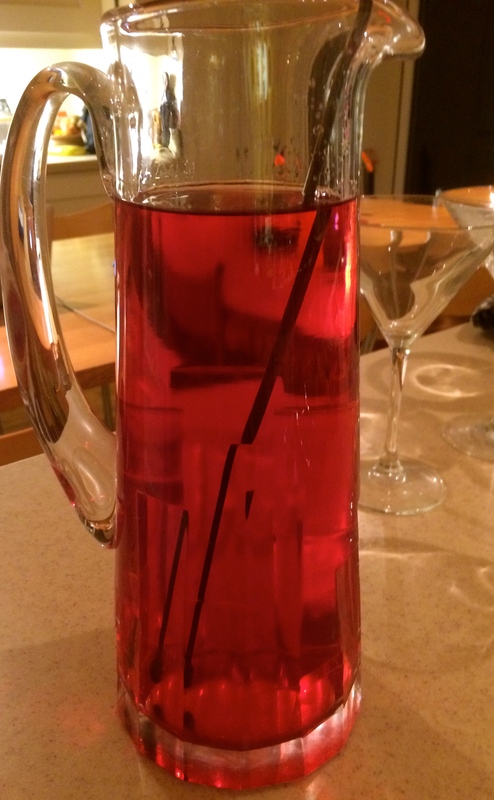 Nothing at all to do with the the consumption of the aforementioned JC Cosmos, of course. I will do them at some point. We didn’t quite manage to watch a Joan Crawford film in the evening either, far too busy chattering. But the Battenburgs did watch the fabulous Mildred Pierce on Sunday evening. What a marvellous performance by Joan!